Even In Park Cities, Danger Lurks On The Corner. The little boy answered quickly, saying he was in a hurry and his mom needed him home right away. Hallelujah that all that "stranger danger" talk sunk in and he actually did the correct thing!! He kept walking his dog around the block, and came home to tell his Mom about it. In the meantime, this same man then knocked on another neighbor's door a couple of houses down and began to ask her a series of bizarre questions, and making strange statements like, “don’t call the police, they’ll have fifty cars here in minutes”. Concerned, she called another neighbor about the encounter. The man was still parked on the street when the Mom of the little boy walked down to see what was going on; he then drove off, but not until after they were able to get his license plate. After a very quick and thorough comparison of events that had just transpired, the women of my street called 911. The UP police responded very quickly. The police were able to track him down quickly, and arrest him at the Park Cities Bank at Douglas and Lovers. He was in the drive through, trying to somehow scam money from the bank teller. The officer told me this man was in desperate need of money. He had gone to one of our neighbor’s houses (he lived behind them as a young kid, but had not seen them in 25 years) to beg them for money. He did have a criminal record, mainly of unpaid tickets, and they found something in his car that led the police to confiscate it. The officer did not mention drugs, but he did mention possible mental illness. The officer told me he did not think this man had bad intentions towards the little boy. We are SO LUCKY to live in a neighborhood with so many wonderful kids and watchful parents, but we can’t be too careful! Our block is considering a ‘buddy” system for the kids, even just walking to friends houses to play- there is safety in numbers- the boy in the story above was alone when the man approached him. The good news is this experience has been a wake-up call for our entire block- and no one was hurt! We are very grateful for that!!!! We wanted to spread the word and get the facts straight before the news spread. And, most importantly, remind all our friends to STAY SAFE!" My sister, who as 5 kids (2 biological ad 3 step-children) always tells me I am over-protective. I called my sister tonight to tell her she owed me an apology. 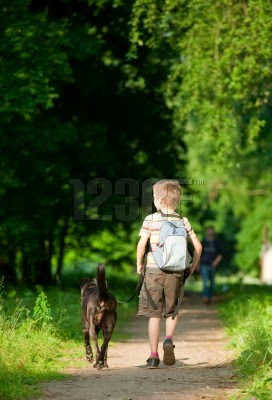 When a little boy can't even walk a dog around the block in the middle of Highland Park... that's just a damn shame.